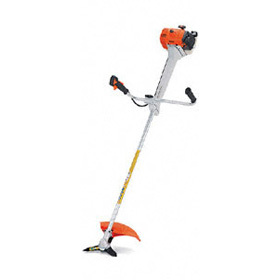 Angle Grinder 4" to 4.5"
Invaluable for mowing tough grass, scrub or clearing vegetation. The ElastoStart system ensures smooth easy starting. A four point anti-vibration system and fully adjustable bike handle ensure maximum operator comfort. The long life filter system with compensator and self cleaning effect considerably extends the intervals between changes for optimum working time. Available in FS 400 K model with a short shaft, FS 400 with a standard shaft or FS 400 L with a long shaft for operators over 6ft. Vibration levels left/right with metal blade 1) 2.0/1.6 m/s². Power output 1.9 kW/2.6 bhp. Vibration levels left/right 1) 2.2/1.7 m/s². Overall length 3) 1.77 m.
Sound pressure level 4) 100.0 dB(A). Sound power level 4) 110.0 dB(A). © 2015 Haddington Hire Centre Ltd.